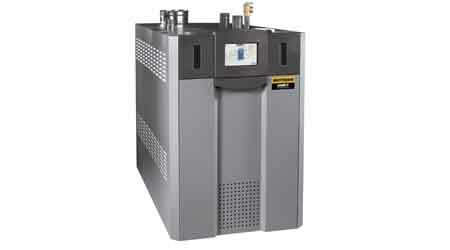 All Laars commercial NeoTherm high-efficiency boilers now come with a large color touchscreen as standard equipment. The easy-to-navigate color touch screen allows for quick access to the control’s full functionality in a user-friendly interface. A new variable speed boiler pump control option, Vari-Prime, is also available that optimizes total installed efficiency by matching boiler input modulation to pump flow. The fully packaged, 95 percent efficient commercial NeoTherm line is available from 285 through 1,200 MBH sizes as a modulating boiler or volume water heater. NeoTherm is a direct vent, sealed combustion boiler or volume water heater that modulates with a 5 to 1 turndown (10:1 for 1,000 and 1,200 sizes). Zero clearance to combustibles and consolidated connections (horizontal or vertical direct vent) make it an excellent choice for tight installations. All NeoTherms include the Laars’ Integrated Control System with PID logic that governs ignition, outlet water temperature, indirect water heater functions, outdoor reset, stages up to 8 boilers with the standard control, and easily integrates with other controls for multiple boiler sequencing and building automation systems. Zero clearance to combustibles make it a good choice for tight installations. The natural gas or LP-fired boiler features an ASME stainless steel heat exchanger and low 10-ppm NOx emissions. Advanced features include full diagnostics and a pullout electrical panel for easy access.